Here’s everything you need to know to find, hire, manage, and delegate repetitive, time-intensive tasks to a virtual assistant. It’s a new rise-and-shine, and you’re ready to tackle the day’s work. Today’s the day you're going to make real progress in growing your business. After all, you’ve had growth strategies in your head for months, and now’s finally the time to implement. Until… you realize you’re behind on logging your payments, you need to book your flight for that meeting, you still have to return all those support emails, your email sequence isn’t written yet, and there are outstanding issues with your ad campaign. And that’s just what popped into your head in the early AM. There’s so much more on your mundane to-do list. When will you ever get past this daily minutiae so you can focus on being more productive and grow your business? Well, we’ve got good news -- bringing on a virtual assistant (VA) into your business could save you from all the headache of daily task managing and free up your time so you can focus on growth. Which is why we’ve put together these tips on everything you need to know to find, hire, train, manage, and delegate repetitive, time-intensive tasks to a VA.
Caveat: If you’re a perfectionist who finds it difficult to let go of performing flawlessly, delegating tasks to a VA may prove to be a tough move for you. But it’s well worth it. So if you’re looking for relief, read on. What is a virtual assistant and what are the benefits of having one? A virtual assistant is someone who provides support services to your business from a remote location. VAs are typically hired on a contract, part-time, or project basis and handle specific support tasks. They often help small-to-medium sized businesses and overtasked entrepreneurs with their day-to-day operations. These days, the area of expertise for VAs runs the gamut. Although “assistant” is in the term, it’s an outdated concept that VAs only support businesses with admin tasks. Sure, they cover duties like scheduling and email management, travel booking, expensing, and invoicing. But that’s not all they do. VAs also specialize in tasks like competitive research, copywriting, social media management, project management, process creation, and customer relationship management. And it's a specialization that’s getting its fair share of growth. In fact, the global virtual assistant market is expected to grow at a compound annual growth rate (CAGR) of 11.60% through 2021. Surprised by that growth rate? Don’t be. The growth rate makes total sense when you know the benefits of having a VA on your team -- which is what we’ll cover next. Nowadays, except for in-person tasks like serving you coffee, VAs can fulfill any support role to help with your business needs. After all, if you conduct your business remotely, there’s no reason that your assistance can’t be remote, as well. 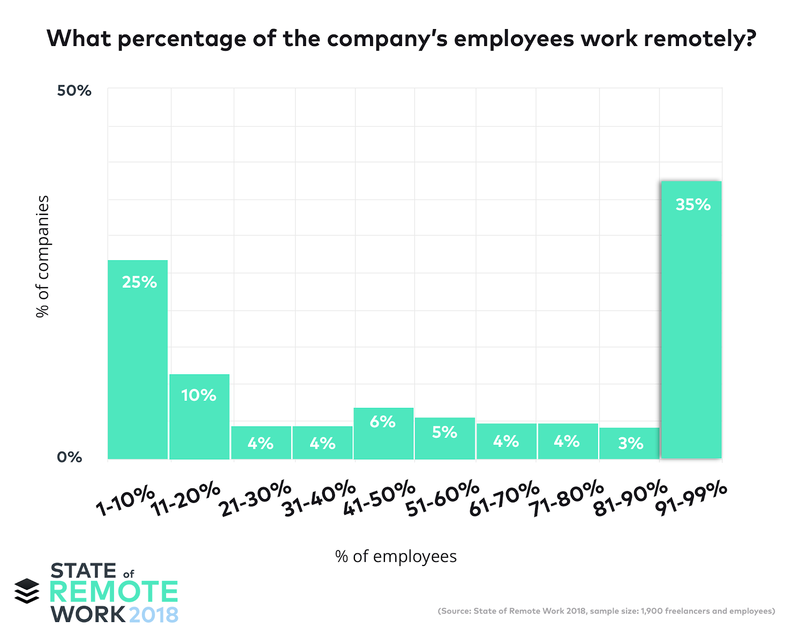 In fact, working remotely is a growing trend, with 36% of US workers currently taking part in the remote gig economy and 35% of companies having fully remote teams. So if the local talent isn’t up to your standards, or you’d just prefer to keep your coffee breaks virtual, a remote team is a great -- and tried-and-true -- option to grow and support your business. Plus, it’s a great way to increase your productivity. You know that entrepreneurial saying, “work on your business, not in your business”? VAs help you accomplish just that. By bringing on a VA, you can delegate your low-growth tasks and work on more profit-generating projects. Offload your menial tasks to alleviate some of your responsibilities and increase the productivity of your business. Not only will your list of duties be offloaded to your VA, giving you the much-needed space and time to focus on pertinent growth projects, but hiring a remote team member in and of itself has been shown to increase productivity. 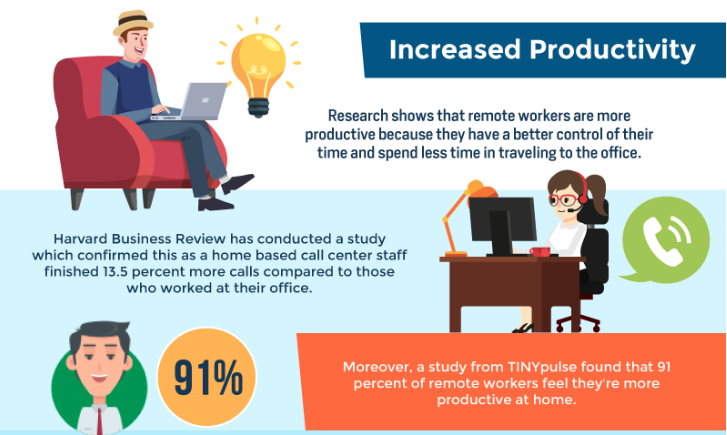 Research indicates that remote team members are more productive, and can even complete 13.5% more work than their in-office counterparts. As a remote worker myself, I find it much more productive to work from my home office where I can control my level of interruptions and “in the zone” times. 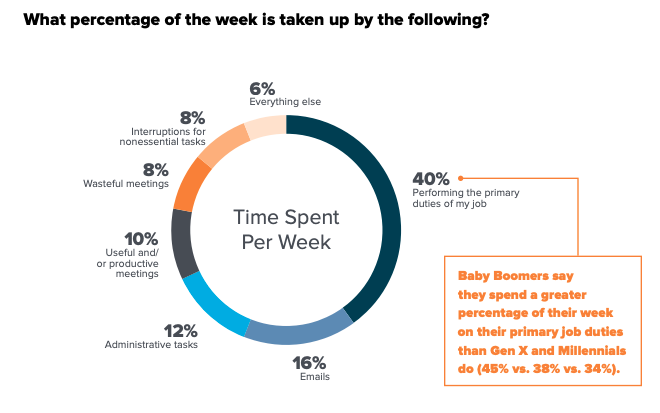 Another study also found that in-office employees spend only 40% of their workweek performing their primary job duties, with big chunks of time spent on miscellaneous things like email, admin tasks, meetings, and interruptions. So, when you hire a remote VA, you’re essentially hiring a super efficient person to take over your support tasks as well as giving yourself more time to be productive overall. And on the topic of efficiency, our next benefit demonstrates how VAs can also increase your revenue. Whether through selling online courses or ramping up your digital downloads, if you’re at a point in your business where you’re ready for more growth, hiring a VA to take over your support tasks can save you both time and money. How? By handing off your low-growth tasks, you can focus on high-growth tasks that bring in more revenue. Let’s say you spend 50% of your days working on repetitive tasks that you could outsource to a VA.
You could pay a part-time VA $15 an hour, or $300 a week, to manage those tasks, while you free up 20 hours of your time to focus on profit-generating activities that could bring in well over $300 each week. As long as your additional revenue outweighs the cost of hiring your VA, you’re golden. 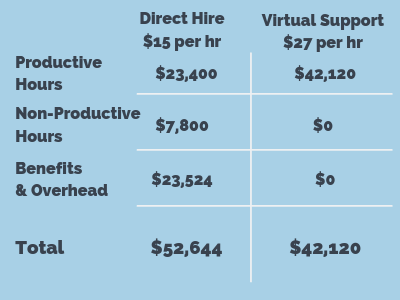 As you can see, with increased profitability, productivity, and support for nearly any business task, hiring your first VA comes with its benefits. Now let’s dig into the steps of how to do it. How do you hire a virtual assistant? To hire your first VA, follow these six simple steps. Your hourly values figured out - Break your time and tasks into values per hour to see if it’s time for the investment (i.e., when you find yourself spending substantial time on $10-per-hour instead of $100-per-hour tasks, it’s time to consider hiring out). Clearly defined tasks that need to be done regularly - Do you have repetitive tasks that you can train someone to take over? A clear understanding of what you’ll focus on with the additional time - Your newfound focus should go to strategic priorities that drive up more revenue for your business than what you lose in expenditures for your VA.
Time to train your VA - You need to be organized enough to dedicate some time to training your new VA.
Why that last? Because training and support are pretty important. 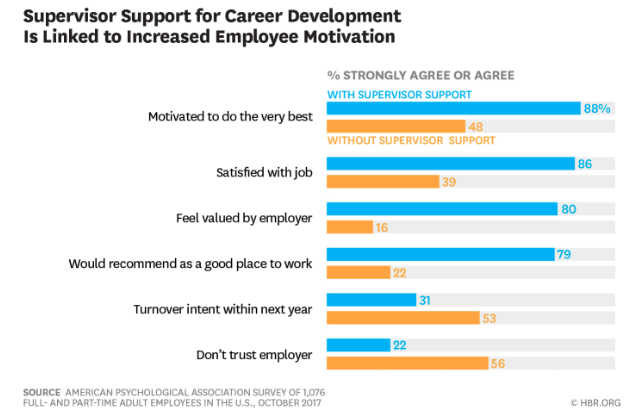 Only 48% of working Americans say they are motivated to do their best work and 39% are satisfied with their job if they lack training and development from their supervisors. Comparatively, 88% of employees with training are motivated to do their best work, and 86% are satisfied with their job. OK, after you’re clear on whether or not it’s time for that big moment of expanding your team-of-one, you’re ready for your next step. Write out the position expectations by specifying what duties your VA will take on and include a timeframe for each task. Scheduling meetings - Your VA can manage your business calendar, coordinating with your various colleagues and contacts and scheduling appointments and meetings. Arranging payments - Your VA can take over your accounts payable duties and make sure all your bills and expenses are paid on time. Managing customer service - Serving as your frontline point of contact, your VA can manage all customer service inquiries and requests. Notice most of these are repetitive tasks that can be systematized and swiftly handed over to your VA.
Not sure about which tasks to give to your VA? Once you know what exactly you’d like to delegate to your VA, you should have a better understanding of how much time you need your VA to dedicate to supporting your business, based on these tasks. And that will allow you to determine the time commitment required from your VA, whether as a part-time, project-based, or contract-based employee to handle weekly support tasks. The final ingredient in this step is to determine your budget. How much are you willing to pay your VA for the tasks and time commitment you’ve just laid out? Keep in mind your savings in “non-productive” hours and “benefits and overhead” when hiring a VA instead of a direct hire. For example, a direct hire at $15 per hour could end up costing you nearly 25% more than if you hired a VA at $27 per hour. 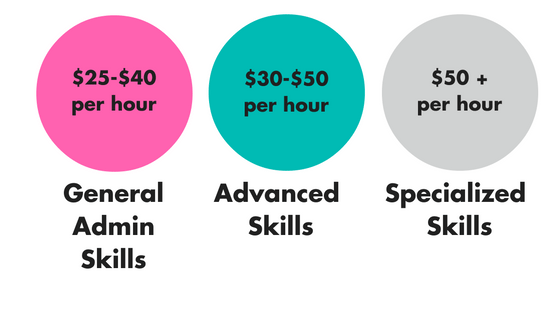 As you can see, the average cost per hour increases as the VA’s skill set becomes more advanced and specialized. OK -- so now you have a clear understanding of exactly what you’re looking for as far as the position details. It’s time to search for your perfect VA.
You’ll notice each site offers a different set of skills at varying price points. Depending on your budget and business needs, you can whittle down this list to a platform that best suits the ideal VA that you’re looking for. From there, just follow the specific platform steps (typically, starting with creating a free account or requesting a consultation) to explore their database of VA candidates. Once you have access to their network of VAs, it’s time to comb through and evaluate the candidates to find the best fit. Most of the sites mentioned in the last step allow VAs to publish a profile that features reviews and testimonials about their work. It’s a good idea to comb through these reviews to get a better understanding of the quality and style of your candidate’s work. In the same way that customer reviews and testimonials improve your sales, they also help guide you to the right hires. 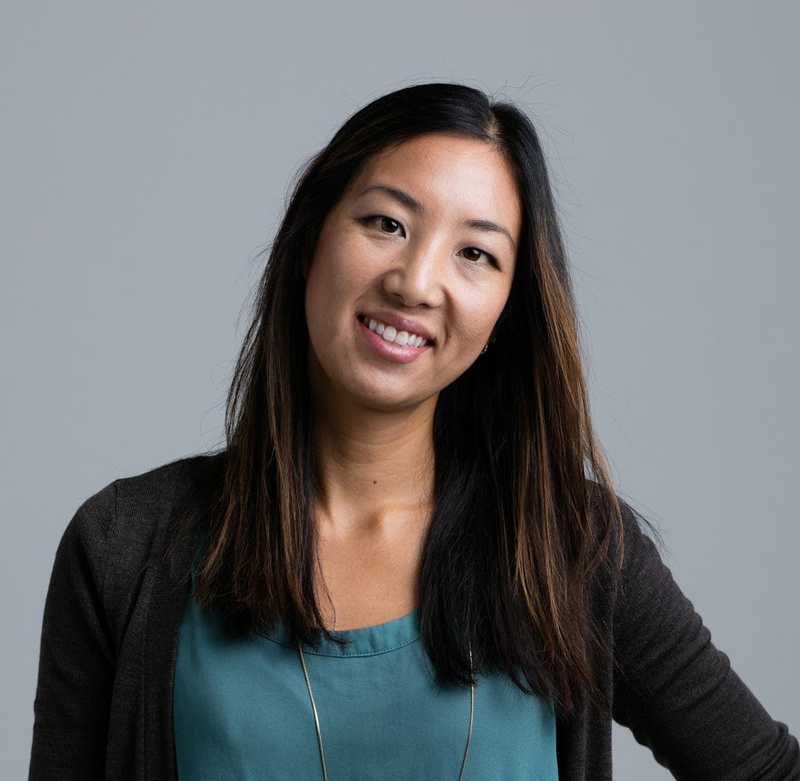 By viewing Diane’s profile, you can check out her scope of work from previously completed jobs, a star rating from the client who hired her, plus some comments about her work. These reviews can also help you gauge how much to pay your prospective VA.
Once you’ve combed through a decent amount of VAs (say, at a minimum, 20), it’s time to select your top five candidates, then reach out and invite them to an interview. Interviewing your candidates is an important step that will help you get to know your VA’s personality and work style. We recommend breaking down your interview questions into three categories: operational and situational, role-specific, and behavioral questions. What would you do if you had an urgent question but couldn’t access anyone to help you? How would you organize this spreadsheet of data? If I assigned you a ton of tasks that you wouldn’t be able to complete by a specific deadline, what would you do? Tip: Make sure your interview questions are relevant to the actual job itself. And giving your candidates relevant tests are also a good way to gauge your candidate’s on-the-job capabilities. For instance, if you’re looking to hire a VA to help with some writing, ask them to work on a test writing assignment. What tools do you have experience using? What are your favorites and why? What type of projects do you most enjoy working on? What are you best at and what do you prefer not to do? How quickly do you respond to emails and communication both internally and externally? When you work remotely, how do you balance personal matters and distractions with your work? What is an example of a time you dealt with a distraught client or customer? How do you normally deal with stress and tight deadlines? Of course, you can further tailor your interview questions to find out more about your VA’s background, years of experience, and how they’ll manage on-the-job tasks. 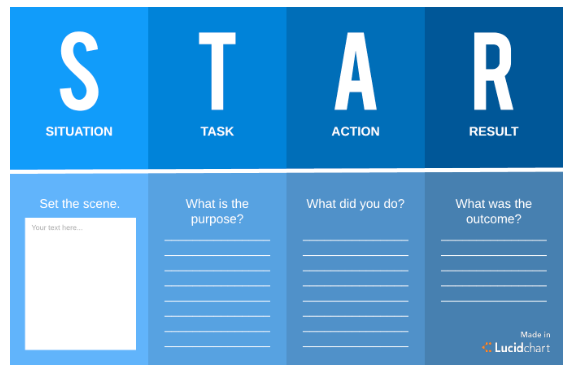 One additional interview process to consider is the STAR method, wherein you ask a question that requires your candidate to touch upon four parts in their answer: situation, task, action, and result. The STAR method gives you more insight into your candidate’s other qualities beyond their resume as they answer your questions in storytelling form. After you have a good grasp on who it is you’re about to hire, the last step is to choose your best candidate and hire your VA.
Out of your top five candidates that you interviewed, select and hire your top choice. If you’re using one of the platforms from our third step, just follow along with their hiring process and terms. It should be pretty straightforward, so long as you have your job requirement and details squared away. Just be aware that each platform will have its own series of steps in its hiring process. 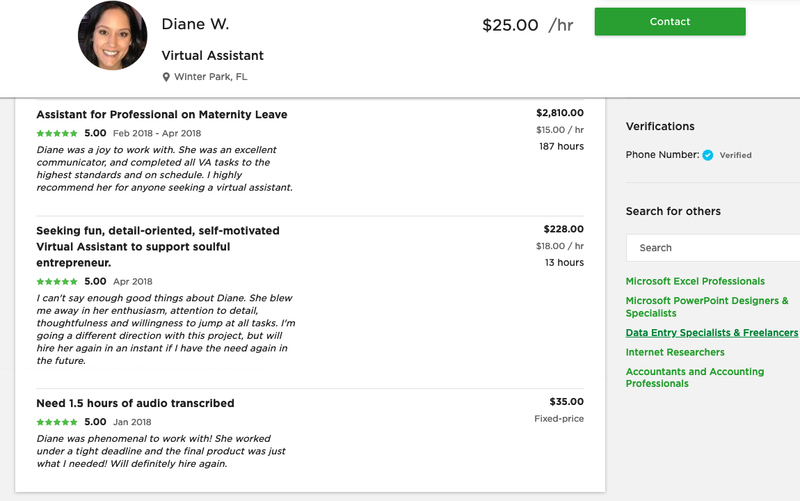 For example, on Upwork’s site, you need to use their licensed escrow service to pay your VA as pre-set milestones are met. The good news is that the interviewing process was the complicated part. Narrowing in on your favorite and moving forward with the hire should be relatively simple. There are a few indicators to pay attention to when it comes to knowing when to hire your first VA, but once you’re crystal clear on both your decision and VA’s job details, the rest is easy. Of course, it never hurts to know the potential pitfalls you might run into with a VA, so to round out our guide today, let’s take a quick look at three easy-to-avoid mistakes often made with virtual assistants. It’s important to create standard operating procedures (SOPs) or, at a minimum, some sort of system or set of guidelines that your VA can follow as he or she takes on duties. The reason for this is to not only train your VA with clear instructions, making the onboarding process simpler, but also to create cost and work efficiencies. In one case, at Microsoft Azure, not having a standardized system in place and followed properly by its employees cost the company 4.46 billion hours of collective downtime -- yikes. To document your SOPs, capture yourself completing each task with associated steps. You can use free screencasts like Jing and Loom to record your voice training as well as any images and videos on your computer screen demonstrating various duties that your VA will take over. You can also create templates so your VA can reference the exact formatting and style you prefer to use in your business. 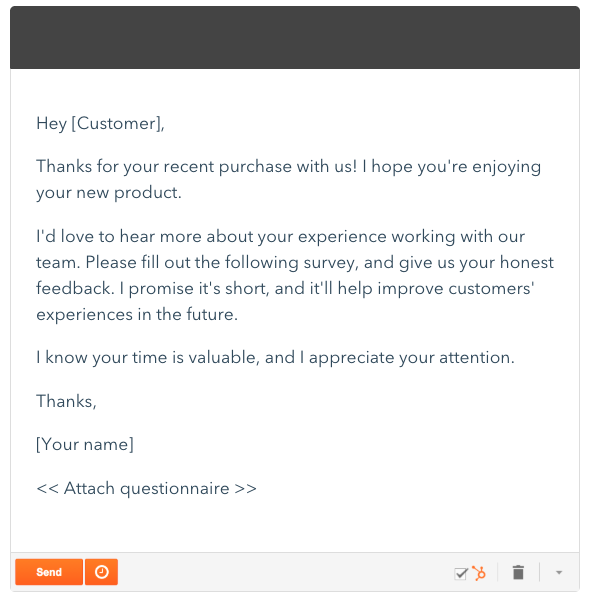 For example, if you have a specific email outline you like to use for particular cases, create a script that your VA can follow in his or her customer responses. You have unlimited options when it comes to creating SOPs, guidelines, templates, demos, training modules, and et cetera for your new team member to follow. The most important thing to keep in mind as you create your onboarding systems is to be very clear and explicit in the direction you provide. This will help set the right expectations for your VA, as well as help them deliver the quality of work that you’re looking for. Beyond that, ensure that the way you’re communicating is being supported -- and not hindered -- by the tools at hand. 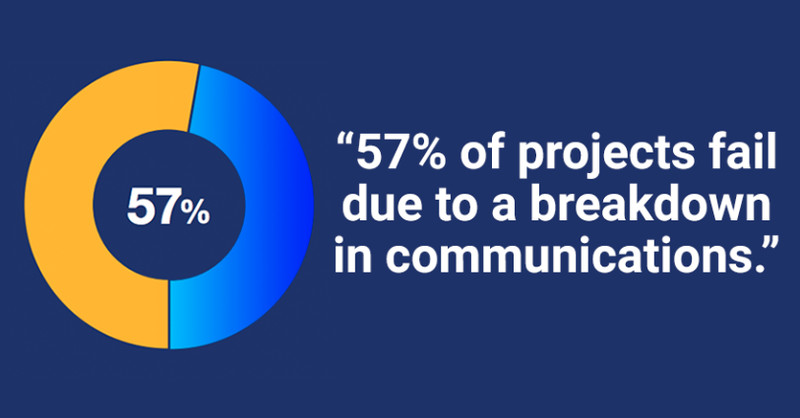 In fact, 57% of projects fail due to a breakdown in communications. Communication tools help you collaborate more efficiently on projects, so there’s less chance of misunderstanding your delegated tasks. There’s one more mistake to avoid, and it’s the last for a reason: there’s no mistake more grave to your business. One of the six core components of a healthy relationship is trust, which means it’s vital to continue to nurture your relationship with your VA to keep them happy, productive, and engaged within your business. And this issue of building trust among employees is not a small one. It’s a global concern with less than half of global employees (across generations) having a “great deal of trust” in their current employers. Managers account for 70% of the variance in employee engagement scores, which means it’s primarily up to you as an employer to grow and develop a trusting relationship with your VA to keep them engaged in their work. Avoid the mistakes of not having SOPs and an effective communication system in place, as well as not building trust between you and your VA. If you’ve reached a growth point in your business where you’re ready to move your business from side-hustle to main-hustle, and you no longer want to be bogged down by repetitive tasks, hiring a VA may be the perfect solution for you. Hiring a VA provides numerous benefits for your business including virtual support in nearly unlimited ways while increasing your productivity as well as your profits. The first step to hiring a VA is knowing when you’re ready to hire, which means you have a clear understanding of defined tasks that you want to offload and the associated hourly figures analyzed. Once you have your position details worked out, your next steps are to research, recruit, review, and then interview your top five candidates from your chosen database of VA candidates. After whittling down your top five candidates to your single favorite VA, it’s time to officially hire your VA.
As you go through the hiring process, avoid not having an official training system in place, not using effective communication tools, and not building trust in your relationship with your VA. These mistakes could cost your business in the short and long term. Now get out there and alleviate some of your daily repetitive stresses by hiring your first VA so you can focus on growing your passion project into a scalable business. And once you’re ready to ramp up your entrepreneurial career even further, test drive a free, no-obligation online storefront trial, where you can productize and scale your business by selling digital products.